Dragon's Lair will forever have a place in video game folklore for offering an experience which - at the time of release - was simply mind-blowing. Back in 1983 gamers were used to crude and blocky visuals with beeps and chirps for sound, but Dragon's Lair offered movie-quality animation and audio. The catch was that player interaction was incredibly limited - it amounted to little more than pushing the joystick or pressing the button at the correct time in order to trigger the next animation sequence - but that didn't prevent it from becoming a massive commercial success, and it has since been converted to a wide range of formats, including the Wii and DS. The have also been more 'traditional' spin-offs for the SNES, Game Boy, NES and GameCube. 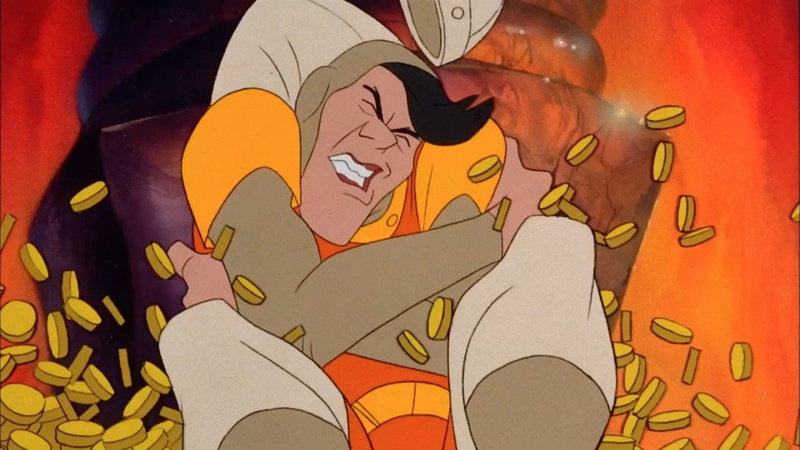 Now, creators Don Bluth and Gary Goldman are seeking funds in order to turn Dragon's Lair into what it arguably should have been in the first place - a full movie. Both men are former Disney animators and have been responsible for several movies over the years, including An American Tail, The Land Before Time and Titan AE. The pair have taken to Kickstarter to ask for $550k to create a short video pitch which can then be used to approach investors in order to raise the proposed $70 million they expect the final film to cost. The movie is being pitched as a prequel to the game. You can watch the Kickstarter campaign appeal below, and after you've done that, why don't you tell us if you're backing this venture? This might be sad, but for some reason I thought Don Bluth had passed away. Actually really happy to hear that isn't the case. I met Don Bluth along with Gary Goldman and John Pomeroy at Comic Con yesterday. It was amazing! They signed my Secret of Nimh, Land before Time, Anastasia, Titan AE and Treasure planet. I hope Dragon's lair movie becomes a reality since I grew up watching their movies. Given this is for nothing but a pitch that very well might not actually be picked up by anyone, there's not really much incentive for someone to sink money into this. I've never had a chance to play Dragon's Lair, but I'm more than will to contribute to this. Don Bluth's films were my childhood! He's the reason I want to become an animator. I was a big fan of Kickstarter until a lot of malarkey happened with it over the recent past, and several projects that I backed simply tanked. Although I don't like backing KickStarter projects on principle, this is one that might get money from me. I'd definitely be keen on see a Dragon's Lair movie, and have fond memories of the old games (despite thinking they were pretty horrible from an actual gameplay perspective). Between Dragon's Lair and Space Ace, Lair had the weakest story and almost zero dialogue. So no. But I'd check out a Space Ace flick. It will be awhile before I can get some money to support this, but I wish them the best of luck. I know they have been trying to get this movie pitched for quite some time now, going as far back as 2000 after Titan A.E. I'd watch anything Bluth and Goldman produce, as they were a driving force that made the Disney Renaissance of the 1990's happen, and made me a lifelong fan of animation. One of the major games from my childhood. TOTALLY backing it. I only remember Dragon's Lair on SNES and a trailer for Dragon's Lair 3D on GameCube. Still, just the idea of having one more Don Bluth movie is exciting enough to get me interested. The only issue is that if I backed this kickstarter, it would only be for a chance for it to actually happen. That is so awesome, would of loved to meet those guys. Loved all his movies. @Naoiko Don't feel bad. I actually thought Mr. Bluth had passed away too so this is really great news!! I love his artistic style. And now I want to hop in my Delorean and travel back to the 80's to play this arcade game. I never thought I would ever see this, backed it in a heartbeat! Don Bluth is such an inspirational man to me. Don Bluth? I didn't know he was still around. He made some of the best movies back in the day. I would love to see a return of his movies as long as he stays away from tooth-rot, boring crap like he did with Thumbelina, Troll and the millions of LBT sequels. @Naoiko I did too. I mean he just dropped off the map, which was weird since his movies were a huge part of my childhood.